Activated platelets. 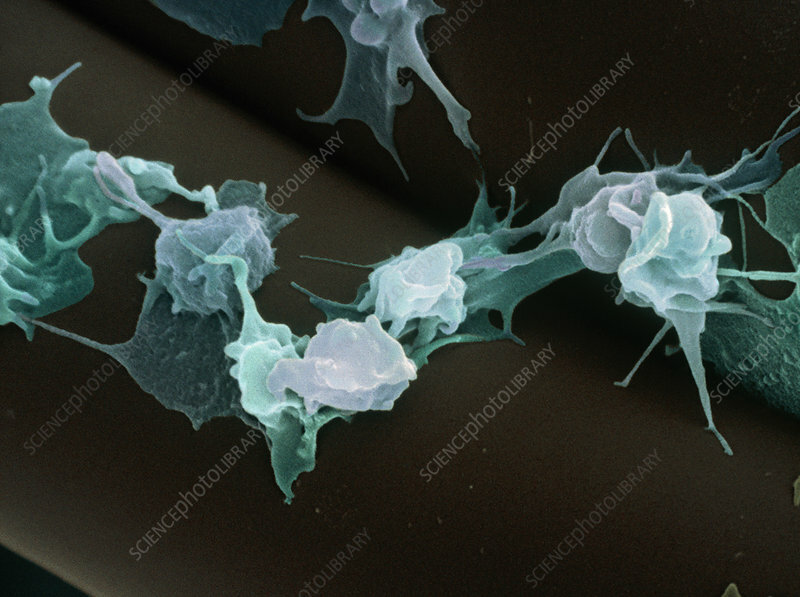 Coloured scanning electron micrograph (SEM) of activated platelets (blue) on a cellular filter (grey). Platelets, or thrombocytes, are a constituent of the blood formed in the bone marrow. When they encounter a damaged blood vessel they become activated and secrete chemical mediators, including serotonin, which cause the blood to clot. The mediators convert soluble fibrinogen to the insoluble protein fibrin. The resulting fibrin mesh traps platelets and red and white blood cells, forming a plug that seals the damaged vessel. A cellular filter removes cells and other small particles from fluids. Magnification: x4000 at 6x7cm size.